Rajasthan’s climate is as diverse as its culture and people. While the western regions are dry and arid, the southwest is undulating and wet. This means the climate varies between hot days and cold or cool nights. Rajasthan attracts tourists all through the year and you can have a good time irrespective of the weather, but there are certain periods more conducive to travelling. The winter months are your best option and exploring is easily done. The post-summer period is another good time to visit and you might just bypass the tourist traffic. However, if the only time to visit is during the summer, make sure you stay hydrated and come prepared for scorching heat. The most ideal time to visit Rajasthan is between November and March. The average temperature around the state is a comfortable 25°C, making the days pleasant and sunny, while there’s a slight chill in the air at night. Light woollens will suffice for Rajasthan winters. 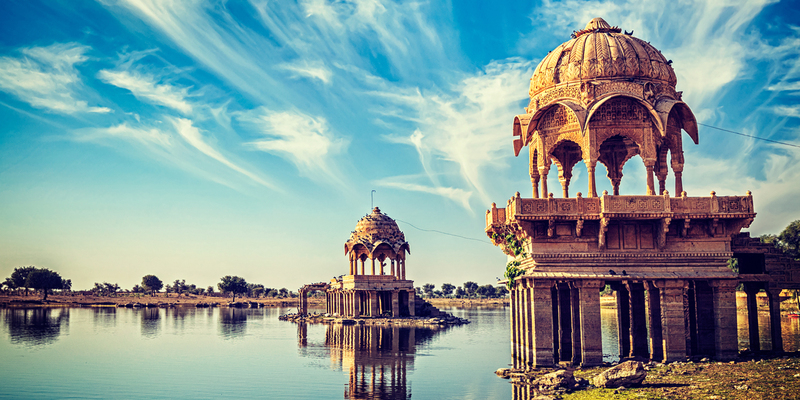 Outdoor exploration of forts, palaces, temples, lakes and gardens are perfect in winter. The warm sunlight makes outdoor activities such as ballooning and paragliding a much more pleasant experience. Rajasthan’s only hill station, Mount Abu, experiences temperatures that sometimes fall to 0°C in January. Popular tourist destinations like Jaipur, Udaipur and Jodhpur are lovely in winter and a number of local fairs and festivals take place during these months. Make sure you book your tickets well in advance if you’re visiting Rajasthan between November and March. This is peak tourist season and hotel prices are highest during the winter months. The festival of Holi (late February/early March) and Diwali (October/November) are Rajasthan’s main festivals and you should plan in advance to enjoy these celebrations to their fullest. If you’re a wildlife enthusiast and birdwatcher, the winter months are the best time to visit the Ranthambore National Park, Sariska Tiger Reserve, and Keoladeo Ghana National Park. A Rajasthan monsoon is unlike any other in the country. Dust and monsoon thunderstorms announce its arrival by the end of June. By the time July comes around, the desert zones get much needed respite from the heat, while the eastern and south-eastern parts are in the grip of the monsoon. If the rainfall is heavy, the day temperatures drop making Rajasthan a pleasant experience in August, while the humidity increases at night. By September, the monsoon is ready to leave the Land of Kings and temperatures begin to increase a bit. October is characterized by occasional heavy showers and is the post-monsoon month that allows national parks to open their gates, comfortable temperatures, and tourists start flowing in. The lakes of Udaipur are a romantic sight in monsoon, and the town of Pushkar falls under a magical cloud cover. The monsoon jeep safaris in Narlai village are a must try and the town of Bundi receives some of the highest rainfall in the state. If you’re looking to experience a different side of Rajasthan, July to October are the perfect months. The temperature in the monsoon and post-monsoon fluctuate between 35-40°C. However, the rains make the days much more bearable. Most tourists prefer landing up in Rajasthan during the winter months, making the monsoon period the perfect time to get great deals on hotels and havelis. You can also side-step the touristy crowd making your trip a quiet and memorable one. The summer months in Rajasthan are relentlessly hot and the temperature is a whopping 32-45°C. If a summer trip is your only option, make sure you drink enough fluids and plan outdoor activities for the evening when the heat lets up a little. Hot winds called ‘loo’ blow through the state adding to the humidity. At night, depending which region you’re in, the temperature ranges between 20-25°C. Udaipur and Mount Abu are the best options for a Rajasthan summer visit. Mount Abu, being a hill station, enjoys pleasant weather and is an enjoyable retreat from the scorching heat that descends on the rest of Rajasthan. July to March are the ideal months for a Rajasthan visit. This way you escape the heat and enjoy Rajasthan in all its natural and man-made splendour.